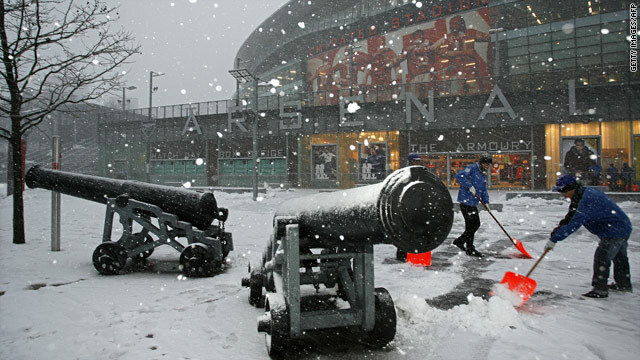 Arsenal's English Premier League match against Bolton has been postponed because of heavy snow. Arsenal's English Premier League clash with Bolton has been postponed because of heavy snow in north London. The playing surface at the Emirates was fit to allow the match to take place on Wednesday evening but there were safety issues affecting fans. The postponement of the match was the latest football fixture to be hit by the recent harsh weather in Great Britain. (CNN) -- Arsenal's English Premier League clash with Bolton has been postponed because of heavy snow in north London, the club have confirmed. The playing surface at the Emirates was fit to allow the match to take place on Wednesday evening but there were safety issues affecting fans and concerns about transport. A statement on the club's Web site said: "Despite making every effort to stage tonight's match against Bolton Wanderers, the sudden and unpredicted adverse change in weather conditions in the Highbury area has left us no choice but to postpone the fixture. "We apologize for any inconvenience this has caused and wish to state that this decision was not made lightly and supporters' safety and travel arrangements were major factors in our thinking. "All tickets currently held will be valid for the rearranged fixture." The postponement of the match was the latest football fixture to be hit by the harsh weather in Great Britain. Manchester City's League Cup semifinal clash with Manchester United scheduled for Wednesday evening was called off on Tuesday along with Blackburn's tie with Aston Villa.